Ordering wasn’t an easy task for me, because I was just recovering from a bad stomach flu. I had to pick something light so I avoided pulled pork, braised beef, or anything rich and heavy. I opted for the Breakfast #11 — Coconut Milk Pancakes with Roasted Apples, Seasonal Fruit and Yogurt. 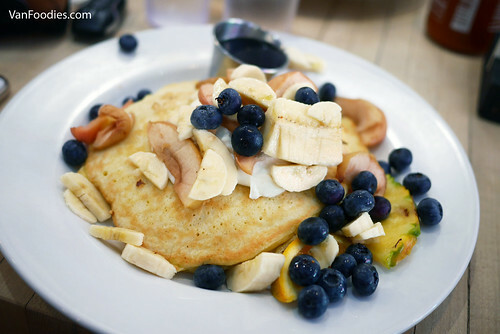 I thought coconut milk pancakes wouldn’t be too heavy and there would be a good dose of fruit on the plate. Haha the portion size was not for the faint of heart. There were 3 good sized pancakes, topped with loads of fruit, and a big dollop of Greek yogurt. The pancakes were fluffy, eggy, and lots of coconut flavour from the shredded coconut. The roasted apples added acidity, and yogurt and banana added creaminess. I couldn’t finish them all, but it was quite good. Honestly, I was really eyeing #12, which was 2 coconut milk pancakes with pulled pork and fried egg in between, and bourbon maple syrup and spicy sour cream. Doesn’t that sound delicious?! Our next-table neighbour was having it and it looked so good! I was jealous. 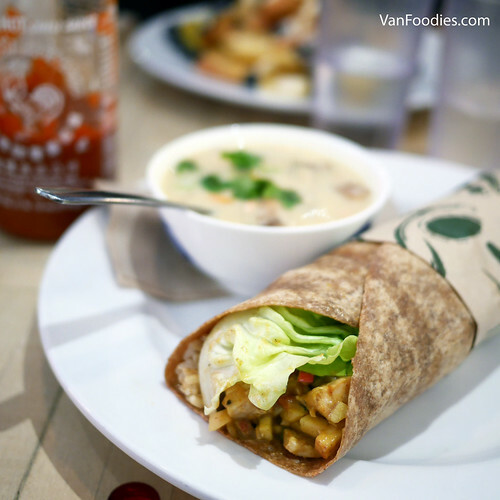 Mr. ordered Lunch #11 — Curry Chicken, Apple Tomato Chutney, Brown Rice, Green Onions and Cilantro in a whole wheat wrap, with a cup of Seafood Chowder on the side. Gee it was a big wrap! The curry chicken had good flavours, with good balance of acidity from the chutney. A little too much rice, though, to the ratio of curry chicken and everything else. Oh did I mention Mama Lam and Papa Lam joined us for this portion of the trip? 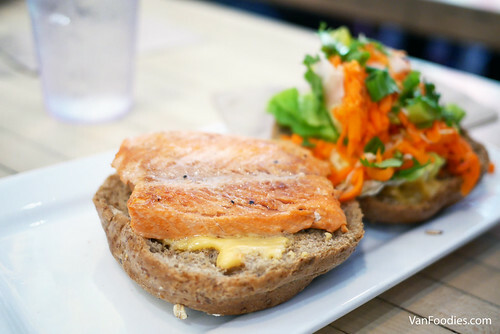 Papa Lam ordered Lunch #15, Wild Salmon Burger with a Sriracha Mayo and Pickled Vegetables. The salmon wasn’t dry, which would’ve been my biggest fear. It was a decent portion too, but I wish they included a side such as potato chips or fries, just to make the plate more interesting. That being said, consider it’s only $10, it’s pretty good value. Mama Lam was probably the smartest one. She just went for Breakfast #4 — Ham and Egg English Muffin with Chipotle Mayo. She’s not a big eater so it was just enough food for her. 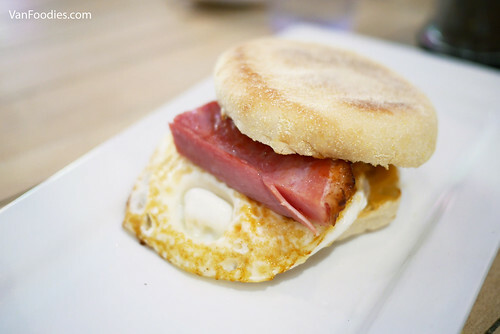 It was not like fast food muffin sandwiches, with a fried egg and thick cut ham. And’s only $5! Interesting approach to ordering here. Menus are on clipboards near the entrance. You may pick up a menu to study, and once you know what you want, go up to the cash register to order. You will be given a number and food will be delivered to your table. There is a sign near the entrance telling you to only be seated after you place an order. I must confess, I asked Mama Lam and Papa Lam to grab a seat before we ordered. 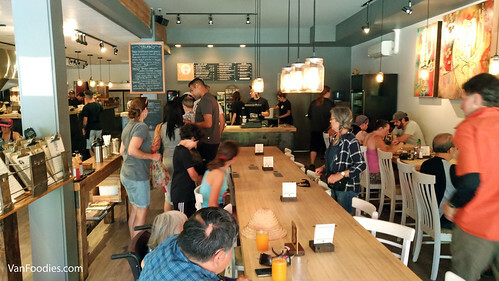 There were more tables than people, and I frankly didn’t think it’s helpful to have four people standing and waiting in line. 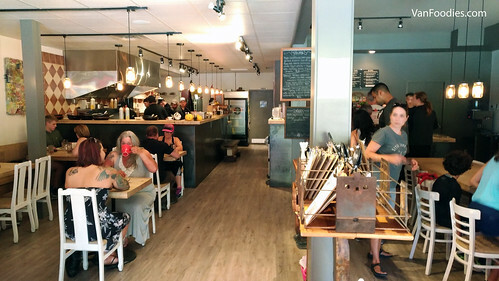 Overall the restaurant is a bit hipster, and has character. Food was quite enjoyable and prices were reasonable. I wish I could order the Pulled Pork Coconut Pancakes. Next time.